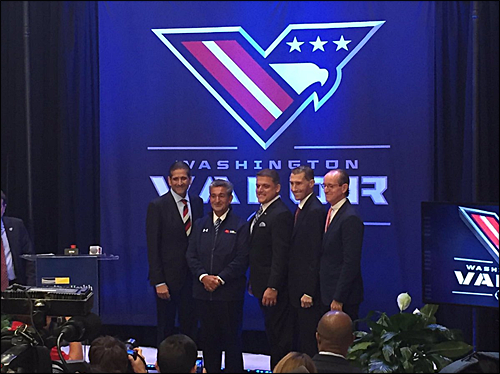 Washington AFL named "Washington Valor"
After 4 long months, fans in the Washington D.C. area finally know what team to root for as the Washington DC AFL franchise announced its name as the "Washington Valor." The team's name and logo were revealed at a press conference Thursday morning. 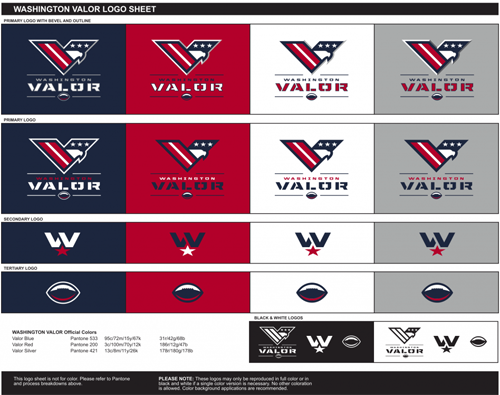 According to the Valor's press release, the name and logos were to "keep in line" with the team's roots in the Washington D.C. Area. The team did just that, incorporating the D.C. flag into the Valor's primary logo. The Valor logo is a bold "V" shape, with two red stripes and one white stripe on the left part of the letter, while the right part consists of three stars against a blue background. A white bald eagle's head is placed inside of the V logo, below the three stars. If you look closely, the v looks like wings that are raising above the eagle's head in mid-flight. The team's official colors are red, white, blue, and silver. Roger Mody, the Valor's managing partner, presented an outline of what each color represents to the team. He was quoted in the Washington Post that red "represents our fire, passion and courage," blue "represents strength, trust, and fortitude," white "represents the purity and completeness of our organization," and silver "illuminates our vision as a way forward." The Valor also revealed their secondary logo, consisting of a blue "W." The W has a diagonal white cut that breaks the letter in half, which draws a person's eye to the hidden "V" shape in the W.
The man responsible for the Valor's logo design is Rodney Richardson, who works for RARE Design. He was also responsible for the current logos 4 NBA teams - the Sacramento Kings, New Orleans Pelicans, Charlotte Hornets, and the Atlanta Hawks. Richardson has familiarity with the Washington D.C. area, having contributed advertising campaigns for the Washington Wizards. AFL Commissioner Scott Butera appeared to gush over the Valor's new name. “I was racking my brain for months trying to figure out what they would come up with and when we saw it we were blown away,” he said. “We love the name. We love ‘Valor,’ especially with what’s going on in our country right now, representing the history of America and the courage and the pride and the honesty. "There's been so much energy and excitement and enthusiasm with this team, without having played one game." The Valor's uniforms were not ready at the time of the team's branding announcement. They are expected to be revealed later this summer. The Valor are the first AFL team in the Washington D.C. since the Washington Commandos in 1990, and the third attempt at an AFL franchise in the D.C. market. Established in 1987, along with the AFL itself, the Commandos played at the Capital Centre in Landover, Maryland. In 1988, the team took a one-year hiatus and returned for the 1989 season, under the name Maryland Commandos. The team returned to its Washington name in 1990, but played at the Patriot Center in Fairfax, Virginia. Shortly after the season, the Commandos folded. In 1999, Washington Redskins owner Daniel Snyder announced his purchase of an expansion team that would begin play at the Verizon Center in 2003. 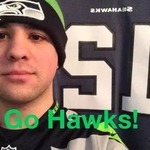 Snyder reportedly named the team the Washington Warriors and even registered trademarks for that name and for an arrow-and-feather logo and helmet design. The team never established play in 2003 and was officially killed off when the AFL folded in 2009. The Valor are coached by Dean Cokinos and will play at the Verizon Center next season. As it currently stands, the Valor are the 9th member of the AFL, but whether that number stays the same going into next season is uncertain.